This is Emily Fuller Drew’s copy negative of a panel card probably taken by someone else sometime earlier. 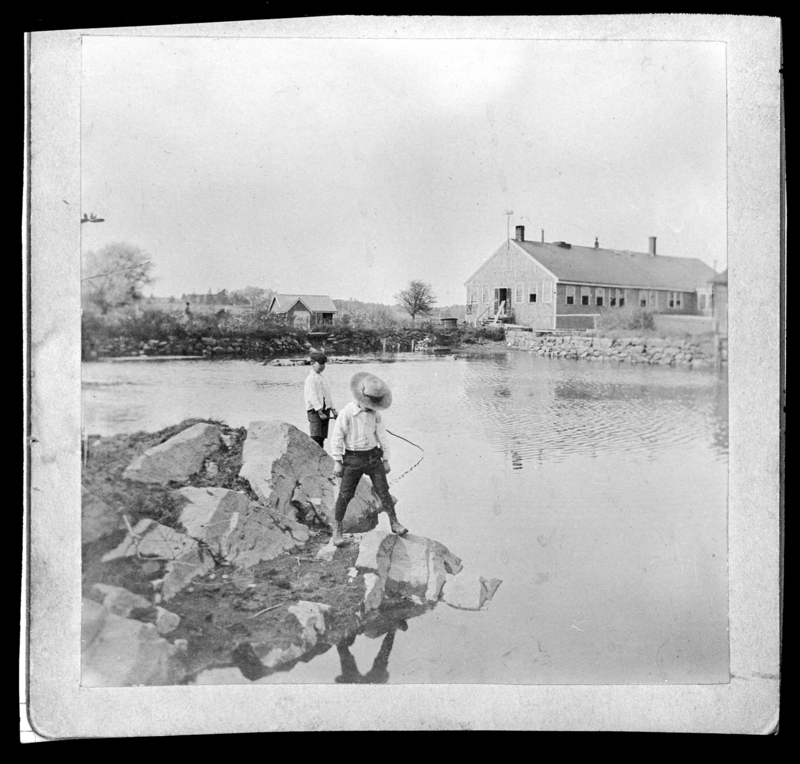 There’s not a lot more information about it: just two boys fishing in the pond that provided water power to C. Drew & Co., the long-lived Kingston tool manufacturer. (There’s a great deal of information about C. Drew and their tools here). Who were the boys? Who knows? That’s not captured on any of the three versions of this image in the Local History Room. Yet, for all the identifying detail lost to history, there’s something painterly about the composition of the two figures and the texture of the image that abstracts it just enough to capture the hazy, nostalgic air of a hot summer afternoon spent fishing. For almost 50 years, Sylvanus Bryant ran a mill located on Sylvia’s Place Road between Bryant’s Pond and Soule’s Pond in the Indian Pond neighborhood of Kingston. 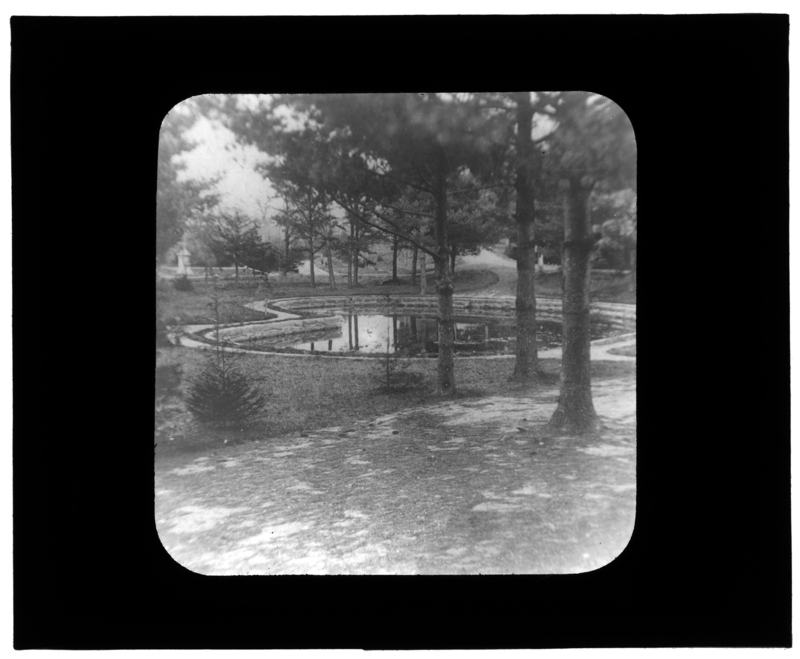 As far back as 1721, several water privileges existed on Furnace Brook, Trout Brook and the man-made ponds that connect them. Around 1810, the Anchor Works (which actually produced spades and shovels) operated on the site of Bryant’s mill. Later, Daniel Bisbee and Henry Soule ran a nail and tack factory there. Next was Thomas Russell, who also produced tacks. In 1856, Sylvanus Bryant Jr. and Noah Prince set up a sawmill to make boards for boxes. By 1879, Bryant had bought out Prince; he continued to operate the mill until 1900. This view, taken from the O.W. Stewart Preserve (part of the Wildlands Trust of Southeastern Massachusetts), shows some of the buildings around Bryant’s Pond. In the left foreground stands a small boathouse, and behind it to the right is the Bryant Boxboard Mill. Behind the mill, the Lyman-John Cushman house and barn can be seen, along with a dirt road that is today’s Sylvia’s Place Road. At the far left is the Deacon Cushman House, which today is 33 Indian Pond Road.